Hatters boss Mick Harford labelled his side’s 2-1 win at Bristol Rovers this afternoon as a ‘massive’ victory in their push for the Championship this season. 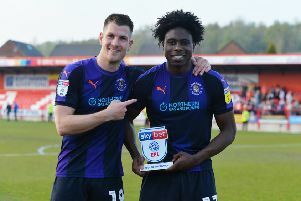 Goals from James Collins and Luke Berry were enough to secure Luton's first ever victory at the Memorial Stadium and equalled a club record of 27 league matches unbeaten in the process. Harford said: “It was a massive win in terms of the season, where we are, a really, really difficult game, and after the first 20 minutes when the game settled down until half time, I thought we were excellent. “The game could have been out of sight, it could have been a lot more than 2-0, and we were a bit annoyed in terms of giving away a goal just before half time. “They broke on the counter attack and scored, (Jonson) Clarke-Harris took it well, it was very frustrating, and I personally think it knocked us back a bit. “We were frustrated in their (dressing room) at half time. "But the players came out, we weren’t as fluent as we normally are second half, and without them really hurting us apart from one chance at the far post that Clarke-Harris had, I thought we defended really well. “The two centre halves were immense again, the goalkeeper (James Shea) came and caught a lot of crosses and took the pressure off. Town also extended their advantage over Portsmouth in third to 12 points and moved 13 clear of Sunderland in fourth, with the two sides playing each other in the Checkatrade Trophy tomorrow. Harford added: “It helps, but we concentrate on ourselves, we concentrate on our business. “We keep working hard, we keep trying to put a team out to win games, and that’s all we can concentrate on.